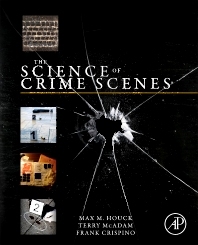 The Science of Crime Scenes addresses the science of crime scene investigation and processing, including the latest methods and technologies. This book covers the philosophy of crime scenes as historical events, the personnel involved at a scene (including the media), the detection of criminal traces and their reconstruction, and special crime scenes, such as mass disasters and terrorist events. Written by an international trio of authors with decades of crime scene experience, it is the next generation of crime scene textbooks. The book provides in-depth coverage of disasters and mass murder, terror crime scenes, and CBRN (chemical, biological, radioactive and nuclear) – topics not covered in any other text. It includes an instructor website with lecture slides, test bank, outlines, definitions, and activities, along with a student companion site with an image collection. This text will be of interest to advanced undergraduate and graduate students in forensic science programs, as well as to forensic practitioners and crime scene technicians. Chapter 2.0. What Is a Crime Scene? What Is Light and How Do We See an Object? MPhil and PhD from the University of Lausanne, Frank Crispino is a former Cadet of the French Air Force Academy and a retired Colonel of the French Gendarmerie, qualified from the French War College (the Gendarmerie is a French police with a military status). During his law enforcement career, he served as: - Head of two Gendarmerie regional criminal investigations departments in charge of investigating serious, organized international crimes and preventing terrorist incidents; - Deputy chief of the anti-terrorism office at the General Directorate of the French Gendarmerie in Paris. - Head of the forensic anthropology department (1993-1997) and the fingerprint department (1997-1999) at the Institut de Recherche Criminelle de la Gendarmerie Nationale (IRCGN – Forensic Lab of the Gendarmerie). - Forensic adviser of the Brigadier General, head of the forensic assets of the Gendarmerie, in charge of proposing new strategies to develop forensic intelligence. From February 1999 to July 2002 he provided forensic capacities to the Palestinian Authority granted by the European Union within the Oslo Agreements, and became Scientific and Forensic Adviser of the European Union Special Adviser Office (EUSAO) in the West Bank and the Gaza Strip on counter-terrorism. He left the Middle East after the destruction of the Palestinian forensic assets in 2002. In the summer of 2012, prof. Frank Crispino joined the University of Quebec in Trois-Rivières, Canada, to launch the first forensic academic programme in this French Canadian Province, aiming at educating forensic scientists dedicated to security traces investigation and analysis. He is the author of about 50 papers in various forensic and security journal. Mr. McAdam has 40 years of experience in the field of forensic investigations. He has served with distinction both the Washington State Patrol (30 years) and The Northern Ireland Forensic Science Service (10 years). He is currently employed as the Laboratory Director of the Washington State Patrol Crime Laboratory in Seattle, Washington. He is also a proud graduate of the University of Ulster, Northern Ireland, where he earned a Bachelor of Science degree in Chemistry in 1979. He has developed subject matter expertise and decades of total experience in the following areas of trace evidence: •	Glass analysis (23 years) •	Paint analysis (23 years) •	Small particle identification (23 years) •	Fibers (14 years) •	Explosives (3 years) •	Hair (17 years) •	Clothing damage interpretation (20 years) •	Scanning Electron Microanalysis (17 years) •	Shoe impressions (14 years) •	Tire impressions (14 years) Furthermore, during the course of his career, Terry McAdam has personally processed over 330 violent felony crime scenes, to include homicides and rapes (175), arsons and bombings (60), hit and run accidents (45), and firearms assaults (50). Terry McAdam has also played an integral role in the investigations of both the Robert Lee Yates (Spokane and Tacoma serial murder) and the Gary Leon Ridgeway (Green River serial murder) cases. He has testified in various felony cases in superior and federal courts throughout the State of Washington on 175 occasions involving trace evidence and crime scene processing. In addition to his academic credentials and work experience, Terry McAdam has successfully completed nearly 900 hours of additional education and training in forensic science and crime scene technology during his tenure with the Washington State Patrol.